This pictures shows the excavation in progress at the Kimmswick mastodon kill site in eastern Missouri as it appeared in 1979. Bones are visible in every square and some have been prepared for removal with plaster jackets to prevent damage. The discovery of Clovis spear points in direct association with Mastodon bones initiated a campaign by local people to incorporate the site into a state park and the construction of an on site museum. Mammoth and Mastodon kill sites are rare in North America. Only a handful have ever been discovered. The first discovery of a mastodon kill site was in 1977 at the Manis site in Washington state where a bone spear tip was found embedded in one of the rib bones of a mastodon. The second discovery happened in 1979 at the Kimmswick site where Clovis points were found in direct association with the bones of another mastodon. These large animals would have provided an enormous supply of raw materials for tools, clothing and food for these ancient hunters. 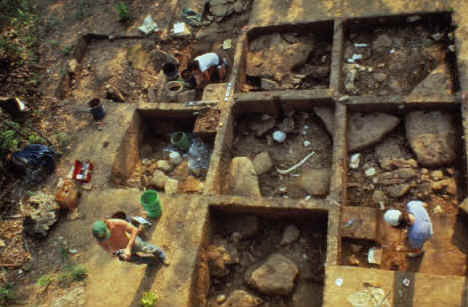 The Kimmswick site has had a long history of excavation. Beginning in 1839 Dr. Albert Koch unearthed skeletal remains which were later identified as Mammut americanum and later sold to the British Museum of Natural history in 1844 where they are still on display. In 1897 C.W. Beehler rediscovered the site and later built a small on-site museum in 1900 which housed hundreds of fossil bones. Several excavations followed Beehler but the most extensive were those of Robert McCormick Adams in the 1940's who left the most complete record of the site. After the discovery in 1979, by Dr. Russell Graham (Illinois State Museum), of Paleo-Indian Clovis points and tools in direct association with Mastodon, public interest spurred on the state of Missouri to form the Mastodon State Park and later construct an impressive on site museum. MISSOURI DEPT. OF NATURAL RESOURCES COLL. This complete and undamaged Clovis point is the featured point for this months cast. It was found in May 1979 and is the best example found during excavation of the bone bed. 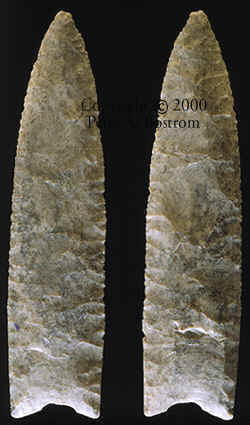 This large Clovis point was considered a major archaeological find. Soon after its discovery it became the driving force behind the campaign for a larger museum than the smaller interpretive center that was originally planned for the new state park. It was discovered in the upper Clovis horizon in close association with mastodon (Mammut americanum) by Dr. Russell Graham and his team from the Illinois State Museum. It represents the first "solid" evidence for Clovis man associated with this elephant-like animal. MO DEPT. OF NATURAL RESOURCES COLL. This is the smaller of the two Clovis points found by the excavating team from the Illinois State Museum. Its been heavily resharpened and may have been discarded as no longer useful by the Clovis hunter who made it. This point measures 1 3/16 inches long. This point measures 4 inches long. This is one of the few artifacts found during excavation of the Kimmswick site. It's a base of a Clovis preform that was broken during the manufacture of a Clovis point. It measures 1 9/16 inches long.